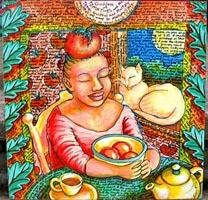 The photo above is a detail of "The Tomato Goddess," a painting on wood, 24" x 24", made by me and now in the collection of Debra Lunn and Michael Mrowka of Lunn Fabrics. 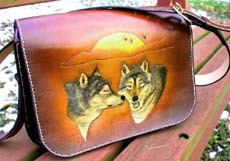 Topics in this diary: Cousin at Jewel Heart workshop; New Kitchen Tarot piece: "The Skillet / Strength;" two of Jimmy's custom ordered leather bags, both wolf bags (wolves are in this year, I guess! ); "Tomato Head;" Shie Night; Bowling Owlies; "My Own Private Wooster;" March Turtle Art Camp; "Calli;" Omari turns two; Suzanne Fisher's art; last trip to Cincy for now; Gretchen and Mike's move to Cleveland; "Valley of the Goddesses;" "2003 Pie;" "LaLa's Kitchen Shoes;" "St Quilta's Begging Colander;" first show reception for Fine Focus 02 at Mansfield, OH. On January 26 I gave a one day workshop at Jewel Heart Cleveland, the Tibetan Buddhist Center which had my solo show of my zodiac paintings about Mom. My cousin Candy ... Candice (Shie) Watson ... was home from Virginia, visiting her mom, my Aunt Pauline, so Candy gave me a ride to Cleveland that day and took my class. She got a new kitten this last Fall, and her piece is about Zoey and her catnip mouse. Growing up, Candy was another artist in the family, and although she didn't pursue that in her career, she studied art in college, and she's now retired and getting back into her art, taking one night a week or so to do painting with a model, with other artists in her area. We're double cousins, since our dads were brothers and our moms were first cousins. Plus Candy and I both attended Kent State University, so we have lots in common. It's great when she visits Ohio now and has time to get together, since for most of our adult lives, we seldom saw anything of each other. 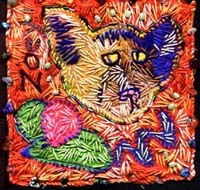 Here's the finished piece, about 5" x 5", "Zoey and Her Mousie," by Candice Watson, my really cool cousin! This is a really good example of a piece started in a one day class taught by me and finished a few days later at home. In the class, she got enough of each of my Lucky School of Quilting techniques to be able to finish it on her own, and do it very nicely, too! The latest Kitchen Tarot quilt is done! It's "The Skillet / Strength: Card #8 in The Kitchen Tarot." This piece is 45"h x 32"w, and was made to suit three purposes: the next Kitchen Tarot card slot, a Valentine's Day exhibition in Cleveland, at Doubting Thomas Gallery in Tremont; and an entry for the Aullwood Audubon Center in Dayton's "Night Sky" competition. So it had to have: 1. a skillet, to be the Strength card in my deck, 2. a Valentine heart, and 3. a big fat night sky, which would leave no doubt that it fit the theme! My friend Kate Arango and I agreed to both of us making a piece to enter in the Valentine show and the Night Sky competition. We dropped everything we were doing and made those pieces in record time! We took the works to Doubting Thomas and had them in the very hip Cleveland show there. But they both were rejected from Aullwood's "Night Sky" show. So boo hoo, but we have them back, to maybe add more sewing to, or not, and to enter into other shows! We all get rejected sometimes, but there are more quilt shows always on the horizon, and the fun time Kate and I spent encouraging each other on the phone, doing our photo shoot together, etc, made it all worth it. And I don't know if I would have thought of putting the big blue sky into this composition, if not for this year's Aullwood theme. And I really love having the moon, stars, and a big comet there above that powerful skillet! By the way, if you have never seen a show at the Aullwood Audubon Center in Dayton, OH, you ought to try to see this one! They do a wonderful job, and the theme is always related to Nature. I've been aware of it from the start, since they'd send me info to send out with the GREEN QUILTS newsletter, which is now an online newsletter, not sent through the mail anymore.And next time, heads up on the Aullwood's call for entries. It'll be a theme show again, and make time in your work schedule to make a piece for its theme! I'll do it again, and I'll see if Kate will! Here's a little detail of "The Skillet." It's Jimmy and a little diary writing about how he helped me make chili that day. 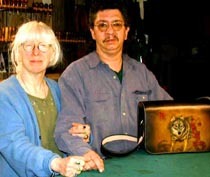 The woman and lion in the center of the big skillet (see above) are meant to resemble the same characters in the traditional Waite-Rider tarot deck, only here it's St. Quilta gently closing the lion's jaws. This piece is all painted on one piece of white cloth, starting with airbrush, then adding Deka Permanent Fabric Paint. You know, the stuff they quit making last year! Ratz! Then it is machine free motion quilted, which I don't really like doing, but it made it go faster, so then I had a lot of hand embroidery-quilting to do, to make up for the too flat machine textures! And then beading. I still want to sew a lot more on this one, but I have so many more images I want to paint!!!! Oh, what to do!!!????? Claire Gerlach in Wisconsin had Jimmy custom make her a wolf bag last year, and when she received it, she called and ordered another one, slightly smaller, the same day! She knew she had to go to the end of his waiting list, so that's why she ordered right away. She wanted it pretty much the same as her first bag, but of course, with different wolf pictures tooled and painted on the three panels. This custom ordered bag has Claire's initials hand designed by me and tooled by Jimmy, who of course tooled all the images one tiny mark at a time.Hand sewn, it has a purple suede lining, a divider, and zippered pockets. This set Jimmy and me both prowling around, to find more really good wolf images. Three were finally selected, and when Claire's order came to the top of Jimmy's waiting list, he began the piece. I was kinda dreading helping him paint wolves again, as they are more tricky than a lot of things. Their fur is so hard to render in a really believeable way, so layered and stippled! 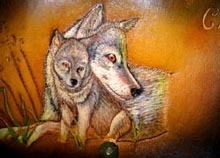 But to my great joy, Jimmy was picking up the nack of how to paint wolves! Practice makes perfect, and he did most of the painting himself this time! My jobs this time were more to be an advisor and to photograph the bag. No problem! I wish you could see the bag, BEFORE he painted the wolves, as all the lines and textures are so defined already by his tooling, and it's so very elegant at that stage, with such intricacy of detail. It doesn't show up in photos, I'm afraid. It just looks like it's painted on flat leather, but it's not! Next I need to add this bag to Jimmy's site, to his site catalog's handbags page. 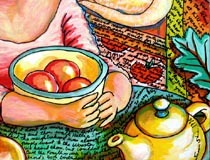 I haven't even added the last three Kitchen Tarot quilt images to this site yet! I am behind miserably! Yikes! 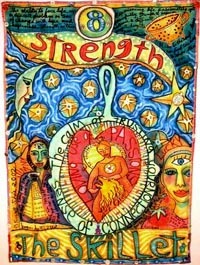 And I leave in the morning for four days in Columbus, for the Art Quilt Network seminar/retreat. Somehow all this stuff gets done in the end, but it seems like Middle Age is when you mainly chase your tail. You know the feeling, right??? t see sometimes, and we bicker a lot, but we get by! "The Tomato Goddess," aka "Toamto Head," aka "Hey, Lady! How Come There's a Tomato on Your Head?" is a painting I made a few years ago on wood. I think it's one of most people's favorites of my art. I'm so happy that our friends Michael Mrowka and Debra Lunn bought it, and that I can still see it when we visit them in Lancaster, Ohio, at their incredible studios and workshop and store at Lunn Fabrics! If you haven't been there lately, you can't imagine how much they've done to that place! And even though they were the very first to make hand dyed fabrics for artwork, they seem to come up with innovative fabric designs all the time, always leading their field, setting the standards! Since sometime in January, we've been having my brother and his kids and grandson over every Tuesday night for Shie Night, for a nice family supper, and so my brother and his son Jacob can do their laundry, since brother Jimmy and his wife are getting divorced. Here are our nephew Jacob, his nephew Omari, and our niece Aimee, Omari's mom, deciding to use their napkins creatively at supper. Because Jimmy and Jacob are kind of roughing it right now, we all have this wonderful excuse to get together! It's been like a holiday dinner once a week, and we really love taking the time and really keeping in touch. If a divorce has to happen, it's nice to have something really good come out of it! On my husband Jimmy's side of our family, we have little Karlie, daughter of Jimmy's brother Freddie and his wife Jackie. 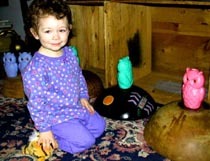 Karlie is two and a half now, and loves to come to our house to play Bowling Owlies. You take these busted patio owl lights, and you stick them on top of these big old wooden upside down bowls. Then you throw the tiger bean bag toy at the owls and knock them off of the bowls: Bowling Owlies!!!!! Karlie and my little great nephew Omari are both totally fascinated by these broken owl lights! There are always new broken ones, too, as we leave our lovely patio owls up over our patio year round. They don't fare so well in the Ohio winter, even with the roof over the patio, so the casualties mount! Here is the former Wooster Food Co-op, now Wooster Natural Foods (Woo Na Foo), which is my favorite spot in town, besides here! This has been the home of the store since late Sept, 99, tho the co-op goes back to 1969! It's one of that rare breed of old hippy health food stores that survived! 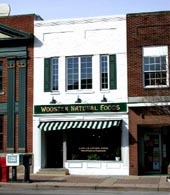 Anyhow, my POINT was that this is the store people in town have to go to, to buy my latest book (March, 2002 publication) "My Own Private Wooster." And the store is in the centerfold map as well as having a full page in the book. There are nearly 30 places to see in my little tour guide of downtown, and my next book will be its sequel, about the sites just outside of town. This is the new quilt I made to be the banner that hangs in Woo Na Foo, above my books and cards. The quilt, called "My Own Private Wooster," measures 17.5"h x 47"w.
It was another of those big ideas I had, where I would just throw it together in a couple of days and have a nice sign for my work at the store! Well, I really liked the painting, and I didn't want it to look like crap, so I had to keep working on it, to make it look nice. I didn't want customers to think I don't sew my quilts well! So there I was, stuck again of my own doing! I sewed and sewed and sewed on that thing. And still would be, but I made myself take it to the co-op and walk away!!!!! I think it has enough of my hand sewing to be representative of my work, tho it could clearly use more embellishment! And here is one of the four identical statues on our courthouse, which I used to illustrate my book and quilt. When Gretchen was a little girl, she would hide her eyes in the stroller, when we'd walk under these guys. Later, when my brother Jimmy's kids were little, I would make up ghost stories about these statues, as the LeRoy stories. LeRoy (in my stories) was an Amish woodcutter, who died a ghastly death along with his three brothers (the other three statues), while trying to cut wood and not be eaten by bears. 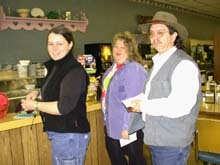 OK, so our March 6 - 12, 2002 camp was the first to use the "My Own Private Wooster" books for the downtown tour! Here are Robin Rice of Auburn, CA and Kyra Heine of Portland, OR, along with Jimmy at The Parlor, our favorite breakfast diner, the starting place of our campweek's Downtown Exploration Morning. After The Parlor, we "did" the antique emproium Uptown / Downtown, then the food co-op, then the used book store, and the Army-Navy Surplus store. Just enough energy was left to get back home and work in the studios all afternoon! Everyone loves our little town, and now we have this FABULOUS downtown tour guidebook by a local author! Yippeee! That afternoon we did the Lucky School of Quilting Samplers, or at least started them, so everyone would know the basic techniques they'd be using all week. Next morning it was all work (and still lots of play, but in the studio!) I did a demo of airbrush, after Jimmy gave his lecture and demos of rudimentary airbrush handling and cleaning. 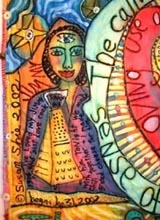 I was making a painting that would become my entry in Quilting Arts Magazine's Calendar Contest. I didn't have any idea of what I would draw, but started with the year's numbers and went from there. Added one St. Quilta the Comforter, one crescent moon, one peapod to echo the moon shape, one big pie in the sky, and oh yes, some cats and a tomato pincushion. After doing the black line work, I colored the painting in with more airbrush and some brush on paints, before doing a demo of sandwiching the painting into a quilt state. Then on to hand quilting and then embellishing it, but that didn't happen til well after camp, since this piece is super "caked" with stitching and beadwork! Jumping to the end of the March camp, here is the group fake quilt, which includes all the work made in the camp, tastefully arranged by Kyra and Robin that last night of camp. Top knot is a little order I began in this camp, for a former student. 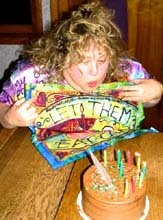 Under that is my calendar entry block, Robin's cat airbrush painting, Kyra's birthday painting "Let Them Eat Cake! ", and so on, down to the lower right being Robin's big new pieces, started as paintings, and overlapped. One is about Robin's mother allowing her dog to sleep in her bed, and the other is about a bitter old woman dying. Not related, the two pieces! Various projects begun during the week are arranged in this big composition. Every time we hold a Turtle Art Camp, the students are shocked at how the cats have breakfast, but here it is. 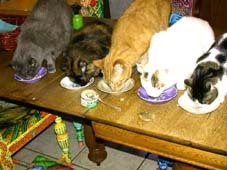 I try to do it when no one else is eating, and if someone is eating, I feed the cats on the floor. I do wipe the table off OFTEN AND THOROUGHLY, in case you're wondering. And only people who like cats and dogs can come to our place in the first place, since we do have five cats and an inside dog, Hattie Clementine Spooler, the well trained and darling black lab. This cat lineup is a little different from the ones that run along the bottoms of the web site's pages, since Maggie and Vikki have both died, and since Tulip and Marigold weren't with us when I designed that cat and dog run and Jan Cabral made it move! ( I still don't know how she did that, but some things should remain mysteries... and it's something about Java scripts, which I think are in the South Pacific.) You will note that I have never made a second annimation! 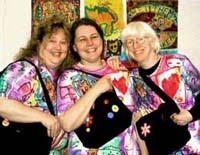 We Outsider Art Quilters are very primitive! So, back to camp. Remember that I said we went to the Army-Navy Surplus store on our Thursday morning of camp? Well, I talked the girls into a pocketbook challenge, and we each bought an $8. ammo bag, which looks like a little purse, really. We ended up not doing very much with them, mostly sewing on some pre-sewn shisha mirrors from JoAnn Fabrics ... only Kyra decided to try doing a real shisha, once I taught them how! But not on thick canvas, Kyra! That woman is DETERMINED! I guess her thinking that it would be perfectly normal to sew a shisha onto canvas is why she wasn't blown away, as Robin and I had hoped, in our evil scheme, when we bought the pre-sewn shishas and quickly whip stitched them onto our bags with bead thread and tiny needles. We had some for Kyra, too, but we wnated her to be amazed and think that we had just very fast hand sewn these fancy flowery shisha. Our diabolical plot just plain fell flat, as Ms. Kyra is a powerhouse, who assumes that sure, anybody can sew through that stuff! No problem! Oh well, it was fun sneaking around a bit anyhow! 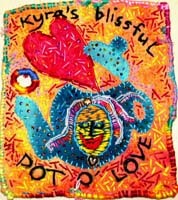 Here's Kyra's first attempts at my Lucky techniques, her "Kyra's Blissful Pot o' Love" teapot sampler, around 5" square, started that first full day of camp, after the trip to town. 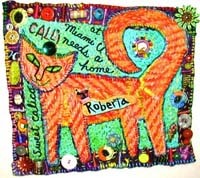 While Robin and I painted next day, Kyra kept on stitching and stitching on this piece, falling deeply in love with it! I think we all did! And I know she's done more to it after camp, so imagine what it must look like by now! 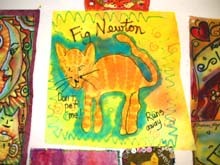 Meanwhile, Robin, who had made a little sampler about one of her cats, next airbrushed this piece about her cat Fig Newton. 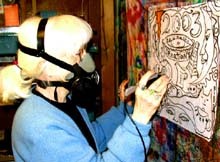 And we were also airbrushing the tee shirts starting around that time. I love it when the camp gets to the point where the students are diversifying, each taking their own path of interest into a focus, and yet coming together in making the tee shirt project together. Because March 14 is Kyra's birthday, and camp ended March 12, it seemed good to get her a little cake and celebrate her birthday ahead of time. She was going to stop in Phoenix on her way back to Oregon, to whoop it up with a nephew, whose birthday was just before hers, but still, we wanted an excuse for a party! 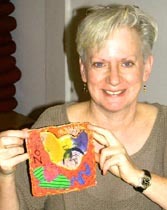 And since, once she did decide to make a painting to quilt, she had made the little birthday piece she's holding here, we knew cake was the way to go! Even though I have for the most part renounced deserts, I do make allowances sometimes, and chocolate birthday cake is not to be missed!!!! While looking at Kyra's picture just now, I was thinking how much fun it'll be to see her again in June at Q/SDS, where we're teaching and she's a volunteer and taking classes. I wish Robin was going to be there, too, along with all the students we've ever had! Wouldn't it be a panic to have a big symposium like that and have all the students we've ever taught all be there at once!!!!!! Wow! Instead of romantic fantasies, I guess I have student fantasies! But I do love our students! 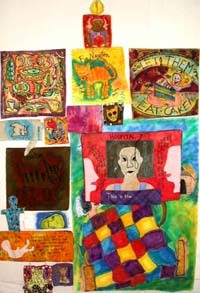 I made this piece in 2000, about a calico stray cat who was living outside at the university guest house at Miami University in Oxford, OH, and who couldn't get a new home, because the people working there had found out she was carrying feline AIDS. Each day, as we went in and out, on our way to teach, we'd brush and pet Calli, and give her cat treats, and at the class, we'd lobby our students, trying to find her a home. Later we learned that the head of housekeeping's husband adopted Calli, and she now lives the life of a queen in a car repair company's main office room! She's big and fat, and not a bit sick! And she is very loved! Kyra Heine bought this piece from me, when she came to camp, after wanting to buy it for two years! She was happy I still owned it, and I am thrilled to know who has it! "Calli" is 9"h x 10"w, with some luscious Lunn Fabrics as her surfaces and with lots of encrustments, including one of my ceramic cat pins. When Claire Gerlach got her first wolf bag, another woman named Santa Ruiz saw her carrying it in a mall, and ended up ordering one for herself, about half the size of Claire's big shoulder bag. Here is Santa's handbag! Jimmy made it right after Claire's second bag, so we had a real whirlwind of wolf bag activity here this winter! This image is on the back, and there is no image under the flap of this piece, so there are only two tooled and painted surfaces this time. Here's the same bag, from the front. 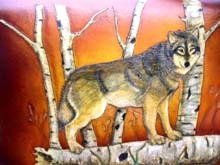 Again, when his tooling was done and he was ready to color the images, I only bailed Jimmy out a teensy on the painting, since he's getting wolf painting down pat! This bag has golden brown suede inside with a divider and pocket. Oh, and I forgot to explain that all of Jimmy's leather surfaces are airbrushed with leather dyes, which is how he achieves that sunburst effect from dary edges to light centers. The leather starts out tanned, but still skin colored, which is the only kind of leather you can tool the surfaces of.